I really did not think it would be such a sunny greeting this morning as I looked out of the kitchen window, but it has returned. After a couple of dreary cloudy days, with even a little rain in between, our early Spring weather is back, although still cold. 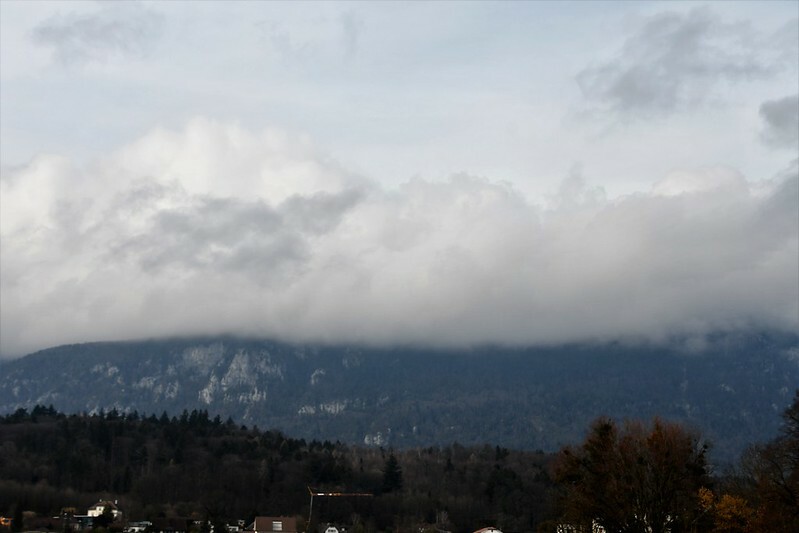 I took a wheelie in my chair into town yesterday afternoon and the Jura mountains were shrouded in clouds at the summits. I decided to have a look yesterday afternoon to see if there were any carnival festivities in our town and I was not disappointed. As I approached the town gate I could already hear the clangs of the Guggamusik. That is the name we call the music played during the carnival season, it is one of our traditions. The drum beat is the powerful part, with many sets of various constructions as they have to be mobile. This group was the first to greet me as I entered town on the specially constructed stage. Note the three sousaphones in the background for a powerful brass sound. The music is popular tunes jazzed up a bit. 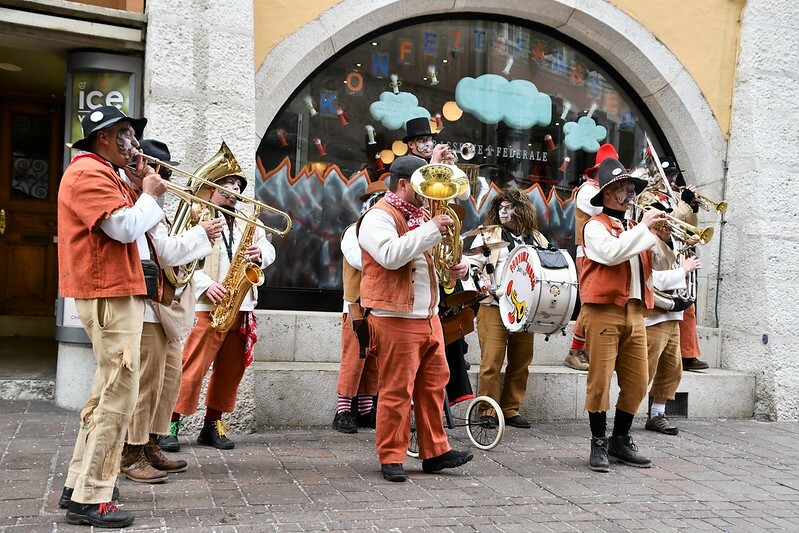 Even the various carnival areas of Switerland have their own style. 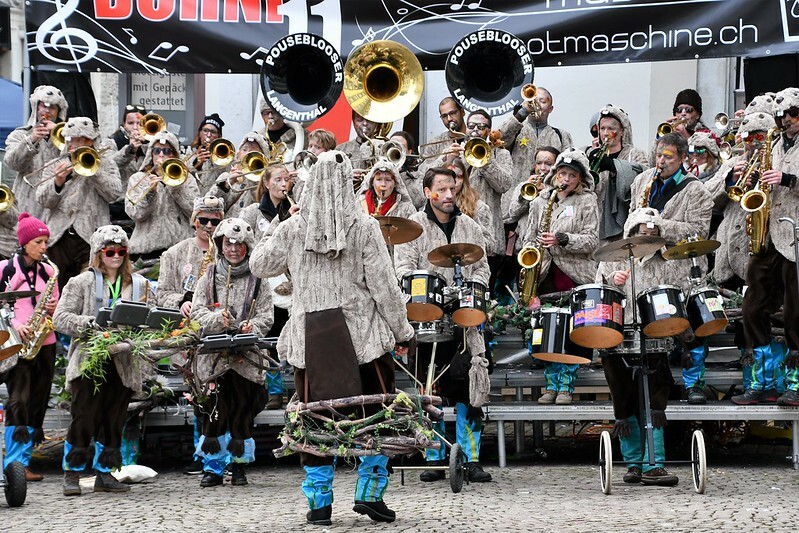 The biggest carnival here is in Basel, a town situated on the French-German-Swiss border-Their traditional music is piccolo and drums and their actual carnival is only three days from the Morning strike on Monday at 5.00 a.m. marching in the streets until Wednesday. The population there say they are the three best days of the year. But back to our Solothurn. It seemed it was a day yesterday for our various music formations to perform in the town. 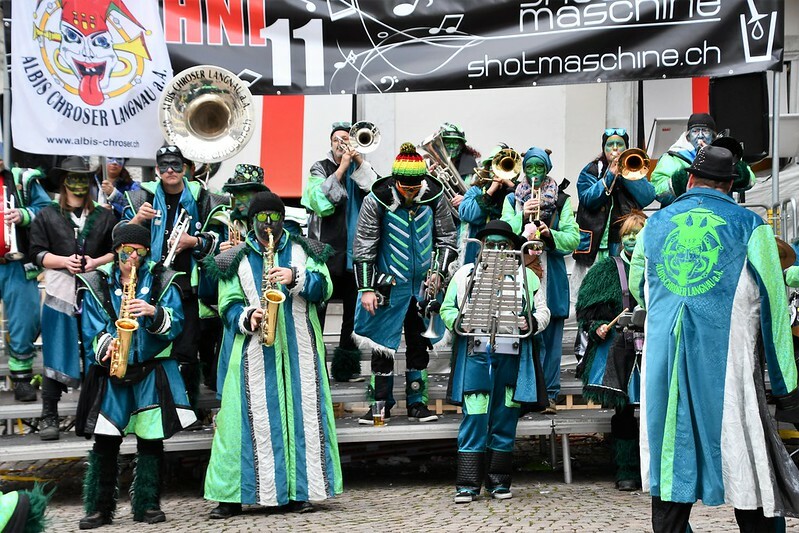 This band only have one sousaphone and they were from another part of Switzerland. Again a wonderful collection of colours. As I turned a street corner I found another group ready to start their music. It was a smaller group and more in the folk music style, but quite amusing. After an hour I decided to wheel my way home again. It was not exactly friendly warm weather for sitting around in a wheelchair. My No. 1 son was also in town having a look around and also saw some music groups. He said later on they all met on the stairs of our cathedral and gave a concert, which is also one of our traditions. After the second procession on Tuesday afternoon it is one of the highlights of the carnival when all the music groups taking place give a live concert. I must say it makes a change to the usual walks I take. Today is the first big procession in town, it is repeated again on Tuesday, with various decorated vehicles, music and confetti throwing. They also throw sweets from the vehicles and hold ironic speeches about various well know people in town who are probably also in the audience. It is a tradition and as an outsider, I realise it is only the locals that really get the whole thing. In Mr. Swiss younger days he also had his enjoyment and rarely spent a night in his bed during the whole celebrations. I suppose when you are younger you have more stamina. Of course the kids have fun dressing up playing cowboys or in an animal costume, mixed with being witches or fairies. 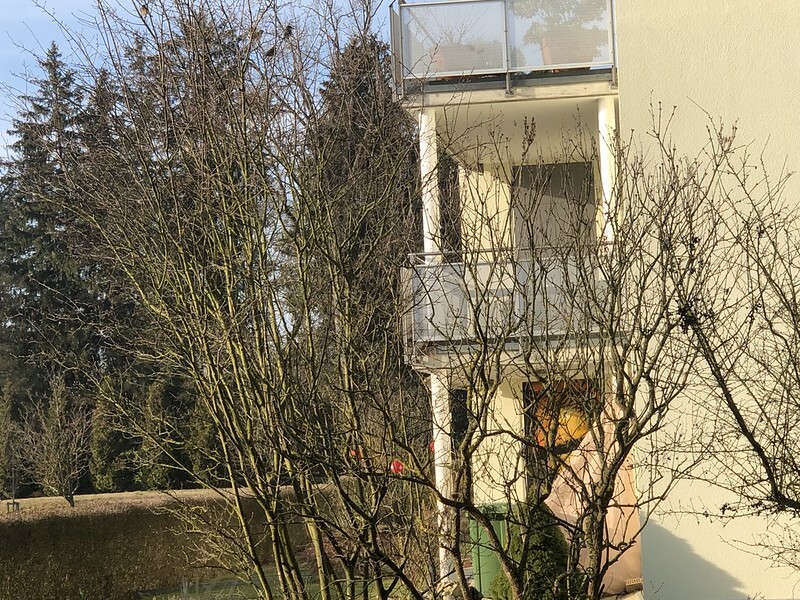 And today will be another normal Sunday for me, no excursions into town, but cooking Sunday lunch and perhaps a Swiss apple tart in the afternoon. 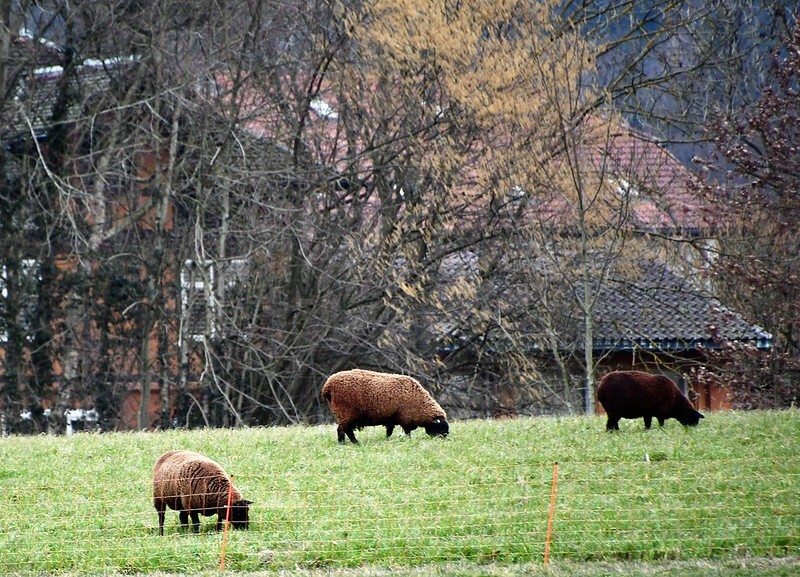 As I wheeled home yesterday I passed the grounds of the local castle and noticed they have new additions of a group of sheep outside: big special sheep, although their Winter coats have not yet been cut. I will make a point of taking a closer look next week. I only manageed a few photos from the other side of the road with the zoom lens. Have a good Sunday everyone, take it easy, and if you cannot, then make the most of Monday. I love this. Makes me “home”sick. Good Morning. Your first picture looks like mine this morning, although mine is quite a mess. I meant the shrubby hedge. Mine is not deciduous, but was quite bare on the inside. It is a long story.